Welcome to Thyme and Space, an Astro-Herb blog series. This is the third of a five part series that will introduce you to the beautiful connection between plant life and astrology. Recap: In the first and second blogs we discussed how every astrological sign is a sun sign and that each sun sign has an element that it represents. Those elements are Fire, Water, Air and Earth. In the previous blogs we covered the elements of fire and air. During this blog entry we will discuss the element of water. Have you ever felt emotionally all over the place? That feeling where you feel a loss of control of your thoughts and of your words and to be frank, of your movements. It’s as though you can’t quite seem to calm the waters of intuition (Cancer), inspiration (Pisces) and transformation (Scorpio). In astrology, water signs rule the 4th, 8th and 12th houses. These houses represent the home, the values of others and the untying of the knots that bind. In these houses, still waters run deep and we often times need help in calming those waters, especially when the body is 60% water. This means that any impact, whether external or internal, can alter the state of your body’s most prevalent resource. And when that happens, all of the other components of your body must adapt….and not always in the most productive of ways. In astrology, emotions constantly change and evolve. Much in the same way that the moon changes and evolves. I’ve heard many people say, that they don’t trust their emotions therefore they ignore them or compartmentalize them. Unfortunately, when you ignore your emotions you also ignore your intuition. The very thing that protects you from yourself and from the negative influences of the external environment. Cancer is the first water sign in western astrology and it is ruled by the moon. This means that Cancerians feel the full brunt of a changing moon…which oftentimes leads to changing moods. It’s for this reason that Cancer born people are traditionally reluctant to show emotion. Scorpio is the second water sign. This is the sign of transformation much in the same way that water when heated turns to steam. Pisces is the water sign signifying faith in the ability to transform, much in the same way that ice has faith that it can transform into water given the right conditions. Chamomile has a sun planet and is a water element. This means that it’s beneficial for any of the sun signs. It is especially useful during major lunar events, eclipses, new and full moons, when most people experience breakups, breakdowns and breakthroughs. 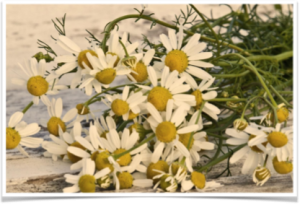 With it’s mildly sedative properties, chamomile allows us to slow down the currents of emotional instability in order to fully understand what it is that we need to nurture ourselves in profitable ways. It allows us to transform what needs to be transformed, inspire what needs to be inspired and have faith in our abilities to become that which we want to be. I would suggest steeping chamomile flowers during full moons when there is usually a bit of anxiety in the air. If the full moon occurs in a fire sign, I would add a fire element herb and if the full moon occurs in an air sign, I would add an air herb. The same goes for full moons in earth signs – use a earth herb. Astrology works by connecting planetary dots and I believe that we can apply those same principles with regards to herbs. What I hope that you have garnered from this blog post is that the element of water is vital. Too much will inundate you. Not enough will deplete you and the right amount will give you a plethora of second chances. In a nutshell, water controls everything yet everything controls water…now replace the word water with the word emotions. Great share! I love how you summarized and ended this post.